Roberto Gomez looks upon his son Pablo after both received the keys to their new home on Monday. Both were surviving victims of a house fire which occurred weeks ago. Weeks after three died in a mobile home fire last December, the Edcouch-Elsa community — where two of the family’s children attended school — sprang into action to help raise funds. That initial gesture snowballed into more than 30 entities and businesses coming together to build a new house for the surviving family members, Roberto Gomez and his son Pablo. They received the keys Monday during a presentation in front of the home. Edcouch-Elsa ISD Assistant Superintendent Francis Rocha said there was an “outpouring of support” when they started selling chicken plates in January. They’d ultimately raise $20,000. When Edinburg Fire Department Lieutenant Ramiro Rodriguez heard the story of the Gomez family, he had to act. As someone who fought fires for 12 years, he said “it was a different ballgame” when kids are inside a house fire. “I literally will die rescuing children,” he said. Rodriguez reached out to Saint Joseph the Worker church in San Carlos, which offered the family food and clothing. A parishioner, Martin Villanueva, called Rodriguez because he wanted to do more. “When somebody calls me for help, I just help, regardless of what religion they are,” said Villanueva, who owns a construction company. They started calling around and were able to receive donations or reduced prices for construction materials. It only took two-and-a-half months to build the two bedroom and one bath home, and Gomez expressed his gratitude for community’s generosity, especially Rodriguez’s. 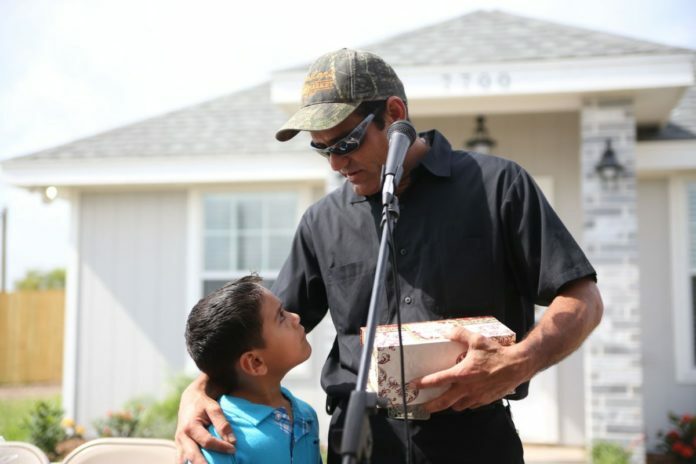 He recalled the lieutenant calling him to convince him to participate, and giving a lot of his time to help make sure his new house became a reality. But Rodriguez is the first to credit the group for what they accomplished for the Gomez family. This act of selflessness and kindness was a good example for his son, Gomez said. “Hopefully, I raise him and see him grow to be a good man of his own,” he said, adding that he’s taking things day by day. “He’s going to grow up being one of them too, helping other people. Villanueva hoped the attention for this story of Hidalgo County coming together will spur more acts of charity. “I know a lot more people are going to help,” he said.